The threat of radiological and nuclear events is a critical concern for all government agencies involved in national security and public health preparedness. Radiation countermeasures that are safe, easily administered, and effective at reducing or eliminating adverse health consequences to individuals and the overall public health impact of radiation exposure are urgently needed. Though efforts have been ongoing for six decades to develop such agents, there has been limited success to have such agents approved by the United States Food and Drug Administration (US FDA) for human use. The development and availability of suitable radiation countermeasures for hematopoietic acute radiation syndrome (H-ARS) and gastrointestinal ARS (GI-ARS) remains a substantial unmet medical need and has been recognized as a high priority area by the government. We have focused on medical countermeasures that are currently under advanced development and have been evaluated for efficacy in large animal models for a survival benefit. Such agents are expected to be assessed fully for their pharmacokinetics, toxicity, safety, and efficacy, with the expectation of being approved by the US FDA for use in humans. As discussed later, the nonhuman primate (NHP) is the most appropriate animal model for developing radiation countermeasures for ARS following the FDA Animal Rule. These agents will be approved by the FDA based on efficacy results from animal models. Their toxicity/safety will be studied in phase I studies once such agents obtain investigational new drug (IND) status. Several drugs have received US FDA IND status, and an additional few agents are progressing well to soon receive IND status. IND filings are generally not indication-specific but product-specific. However, IND is filed to the relevant FDA division based on the first indication being studied by the sponsor. The same sponsor can study other indications under the same IND by cross-referencing the first IND (i.e. authorizing different divisions of the FDA to review the original IND). It is beyond the scope of this article to include all drugs that are presently being developed as potential radiation countermeasures, either against low doses of radiation or as anticancer drugs, agents which are used as dietary supplements, or other plant products which may not be regulated by the FDA for approval and marketing. We have focused on potential countermeasures that are being developed for either H-ARS or GI-ARS. Here, we have discussed countermeasures that are being developed for H-ARS and GI-ARS. The majority of the agents discussed in this article have been investigated in the NHP model for efficacy against whole-body or partial-body irradiation. A few agents have shown promising efficacy in rodents and are ready to move forward to the NHP model for further investigation. One agent has been investigated using the canine model. Advanced development of radiation countermeasures implies the use of large animals for investigations for pharmacology, safety/toxicity, efficacy, and scaling to humans. There are currently nine radiation countermeasures with US FDA IND status. A few radiation countermeasures have demonstrated efficacy in large animal models in addition to small animals but have not yet achieved IND status. We have discussed agents that have US FDA IND as well as the agents that have been tested in NHPs and not yet received IND status. Emphasis has been given to survival benefits in NHP studies though other agents tested for improvement in cytopenia in NHPs receiving lethal doses of radiation are also included. Before discussing individual radiation countermeasures under the above categories, it is important to discuss some terminology used during the development of such agents following the US FDA Animal Rule. Though the discussed terminology is based on US agencies, other countries are coming up with similar pathways for the approval of medical countermeasures for chemical, biological, radiological, or nuclear (CBRN) threat agents. The effective dose can be calculated from kinetic and pharmacodynamics of the product (or relevant data) in both humans and animals. It is reasonable to expect that a drug investigated in animals is to be indicative of human efficacy only when all above criteria are met. The Animal Rule is intended to be used in the development of drugs to counter debilitating or lethal conditions resulting from either accidental or deliberate exposure to CBRN agents. Although no species are specified in the Animal Rule, only animals that can be scientifically justified in terms of key characteristics comparable to the human disease or condition should be used. Likewise, the mechanism by which the drug presents its effects should be understood to determine the appropriate dose and dose schedule for efficacy in humans. The package insert should include information that the drug was approved based solely on animal efficacy studies for ethical and feasibility reasons along with all other information the FDA requires at the time of approval. These details should be communicated before administering or dispensing the drug, if possible. The drugs approved following the Animal Rule must follow postmarketing, record keeping, and safety reporting requirements. To date, only two radiomitigators for H-ARS have received FDA approval under the Animal Rule. No radioprotector has yet been approved by the FDA for H-ARS or GI-ARS. The mission of the FDA's Office of Orphan Products Development is to advance the investigation and development of drugs or biologics that demonstrate potential for the treatment of rare diseases or conditions. The FDA provides incentives to sponsors to develop products for rare diseases. The orphan drug status benefit in the US is a 7-year period of market exclusivity for the indication if an agent gets approved by the FDA for human use. This program has successfully enabled the development and marketing of over 600 drugs and biologics for rare diseases since 1983 while fewer than 10 such agents came to market between 1973 and 1983. The Orphan Drug Designation program provides orphan status to drugs and biologics defined as those intended for the safe and effective treatment or prevention of rare diseases/disorders that affect fewer than 200,000 people in the US or that affect more than 200,000 persons but are not expected to recover the costs of developing the drug. The majority of radiation countermeasures under advanced development have received FDA orphan drug status. Fast track is a process designed to facilitate the development and expedite the review process of drugs or biologics to treat a broad range of serious conditions and fill an unmet medical need. The purpose is to get promising new drugs to the patient as early as possible. Determining whether a condition is serious is a matter of judgment. It is generally based on the fact that the condition will have a negative impact on factors such as survival and day-to-day functioning if left untreated. Filling an unmet medical need is defined as providing a therapy where none exists or as providing a therapy which may be potentially better than available therapy. Any drug being developed to treat a condition with no current therapy is directed as an unmet need. If there are available therapeutics, a fast track drug must show advantage over available therapeutics. Fast track designation is requested by the drug sponsor and such request can be made at any time during drug development. The FDA reviews the request and decides within 60 days. The emergency use authorization (EUA) authority allows the FDA to strengthen the nation's public health protections against CBRN threats by expediting the availability and use of medical countermeasures required during public health emergencies. Under Section 564 of the Federal Food, Drug, and Cosmetic Act, the FDA may allow unapproved medical products or unapproved uses of approved countermeasures to be used in an emergency to treat or prevent life-threatening indications caused by CBRN threat agents when there are not enough alternatives approved and available. Issuance of an EUA by the FDA requires several steps. First, one of the four following determinations must be in place: (a) the Department of Defense Secretary issues a determination of military emergency or significant potential for military emergency, (b) the Department of Homeland Security (DHS) Secretary issues a determination of domestic emergency or significant potential for domestic emergency, (c) the Department of Health and Human Services (HHS) Secretary issues a determination of public health emergency or significant potential for public health emergency, (d) the DHS Secretary issues a material threat determination. Once one of the above four determinations is met, the HHS Secretary can issue a declaration that circumstances exist to justify issuing the EUA. This declaration is specific to EUAs and is not linked to other types of emergency declarations. The FDA Commissioner, in consultation with the HHS Assistant Secretary for Preparedness and Response, Control and Prevention, and the National Institutes of Health, can then issue the EUA if criteria for issuance under the statute are met. The FDA publishes a public notice of each EUA that is issued in the Federal Register. Discoveries of the molecular basis of disease provide unique opportunities to translate research findings into therapeutics. However, new drugs approved by the FDA or other regulatory agencies take an enormous amount of time, money, and effort largely due to bottlenecks in the therapeutic development process. Such development involves a long and complicated path to approval that requires safety and toxicity evaluation as well as evidence of safe delivery and efficacy. It also requires convincing documentation to corroborate manufacturing and stability. It takes significant amounts of time and money to accomplish all requirements. Delays and regulatory barriers mean that the translation of a promising molecule into an approved drug often takes more than 14 years and up to a billion dollars in investment. It is crucial to advance strategies to reduce this time frame, decrease costs, and improve success rates. This is of paramount importance specifically regarding life-threatening situations, for which no appropriate countermeasures are available. Repurposing refers to studying drugs that are already approved to treat some indications and to explore if they are effective and safe to treat other indications. An already FDA-approved drug that is repurposed has a considerably truncated route to FDA approval, saving both time and money. Agents approved for other indications have already been investigated in humans, so exhaustive information is available on their pharmacology, toxicity/safety, and mechanism of action. Further, approximately 80% of drugs that enter clinical trial are never approved by the regulatory bodies for human use. This suggests that for every five drugs that make it into the clinic, there are four that fail to demonstrate efficacy for the indication, for which the agent was designed to be approved. This high-failure rate leads to the availability of a large number of existing and partially developed candidate drugs with known pharmacology, toxicity/safety, formulation, and mechanism of action. Since repurposing builds upon earlier research and development efforts, candidate agents could be ready for other clinical indication studies sooner, accelerating their review and approval by the FDA, and ultimately their integration into health care. Both radiation countermeasures approved for H-ARS following the Animal Rule, Neupogen and Neulasta, are repurposed agents., Both agents were in the clinic for other indications. Currently, several agents such as Promacta, Pentoxifylline, Lova-, Sim-, Atorvastatin, Palifermin, Anakinra, Forteo, Cozaar, Increlex, Oprelvekin, Celecoxib, Mozobil, Neumega, Epogen, Surfaxin, Neurontin, and Metformin were previously approved for other indications and are being evaluated as radiation countermeasures for ARS and delayed effects of acute radiation exposure (DEARE). Some of these agents have demonstrated promising results as radiation countermeasures and are progressing well for the FDA approval. During the early preclinical development of a new drug, the primary goal of the sponsor is to determine if the agent is reasonably safe for initial use in humans during clinical studies and if the agent demonstrates pharmacological attributes that justify commercial development for a profit-making endeavor. When a drug candidate is recognized as a sustainable candidate for further development, the drug sponsor then concentrates on accumulating the data necessary to determine that the agent will not expose humans to excessive risks when used in limited and initial clinical studies. An IND is a request for authorization from the FDA to administer an investigational drug or biologic to humans. Such authorization must be obtained before interstate shipment and administration of any new drug or biologic that is not the subject of an approved new drug application (NDA) or biologics license application (BLA) for biologics. Once the IND is submitted to the FDA, the drug sponsor must wait 30 calendar days before initiating any clinical studies. During this period, the FDA has an opportunity to review the IND for safety to assure that research subjects will not be subjected to unreasonable risk resulting from drug administration. There are three types of IND: (a) An investigator IND is submitted by a physician who both initiates and conducts an investigation and under whose immediate direction the investigational drug is administered or dispensed. A physician might submit a research IND to propose studying an unapproved drug or an approved product for a new indication or in a new patient population. (b) Emergency use IND allows the FDA to authorize use of an experimental drug in an emergency that does not allow time for the submission of an IND in accordance with 21 CFR, Sec. 312.23 or Sec. 312.20. It is also used for patients who do not meet the criteria of an existing study protocol or if an approved study protocol does not exist. (c) Treatment IND is submitted for experimental drugs demonstrating promise in clinical evaluation for serious or life-threatening conditions while the final clinical investigation is conducted, and the FDA review takes place. The regulation of new pharmaceuticals has been based on the NDA in the US. Every new agent has been the subject of an approved NDA before the commercialization of the agent in the US. The NDA application is the vehicle through which the sponsor of any drug formally requests that the FDA approves a new agent for sale and marketing in the US. The data collected during the preclinical studies conducted in animal models and clinical trials in human of an IND become part of the NDA. For biologics, a BLA is equivalent to NDA. The objectives of the NDA are to offer enough data and information to allow the FDA reviewer to reach the following: (a) whether the agent is safe and effective in its proposed use(s), whether the benefits of the agent outweigh the risks, (b) whether the proposed label of drug is appropriate and what such package insert should contain, (c) whether the methods used in manufacturing the drug and the controls used to maintain the drug's quality are sufficient to preserve the drug's identity, strength, quality, and purity. There are numerous benefits associated with the NHP model: (1) NHPs share a similar organ structure with humans. (2) NHPs have a longer lifespan as compared to smaller animal models which enables long-term study. (3) NHPs are suitable for the assessment of GI symptoms such as vomiting while other models are not. (4) The NHP is a well-characterized animal model for the study of radiation injury and countermeasure efficacy. (5) NHPs share similar pathophysiology with humans. Despite all its advantages, this model also has some disadvantages: (1) Ethical considerations make the use of this animal model difficult. (2) Outbreeding of the NHP model results in more variations compared to other models such as the murine model. (3) There is inherently more risk of injury involved in the handling of NHPs. (4) The NHP model has a small litter size and takes a longer time to grow. (5) The hirsute nature of this model makes cutaneous studies difficult. (6) The NHP model involves a higher cost of procurement and care. Despite its disadvantages, the NHP is considered the gold standard as an animal model for FDA drug approval. There are several radiation countermeasures with and without FDA IND, which are under investigation in the NHP model. The majority of recent studies evaluating new agents are not yet published, and data are unavailable. It is expected that such data will be available to the scientific community in due course of time. Some agents that have been investigated specifically as countermeasures for ARS are discussed below. We have also included the agents that are currently under evaluation or moving to the NHP model for investigation. AEOL 10150 (a mesoporphyrin mimetic; C48H56C15 MnN12) is a novel agent currently being developed as a countermeasure against the pulmonary effects of ARS and DEARE. This agent is a well-tolerated, broad-spectrum catalytic antioxidant capable of extending survival benefit and minimizing acute pathology as demonstrated by the studies administering subcutaneous (sc) daily treatments for 28 days to both mice and NHPs. Effective dosing for this drug has been recently explored using radiation-induced lung injury in the murine model (whole-thorax lung exposure with 14.6 Gy) of CBA/J mice. Beyond using this drug to counter high radiation dose pulmonary injury, this agent is also being investigated as a potential countermeasure for GI-ARS. Investigation in NHPs demonstrated that AEOL 10150 administration reduced lung injury and increased survival after 11.5 Gy whole-thorax lung lethal dose (LD100/180) radiation exposure. Daily administrations of AEOL 10150 (5 mg/kg, sc) initiated 24 h postirradiation spared 26% of the treated animals from lung injury that would have been otherwise fatal (100% death in control group). Furthermore, CT scans revealed less pulmonary injury (pneumonitis, fibrosis, and effusions) in the AEOL 10150-treated animals at 60 days postirradiation. In a recent study, NHPs received 10.74 Gy whole-thorax lung irradiation (WTLI) using 6 MV linear accelerator-derived photons. The study comprised four cohorts: one control and three AEOL 10150-treated groups (n = 20/cohort). AEOL 10150 was administered daily sc at 5 mg/kg in each of three schedules, beginning 24 ± 2 h postirradiation: from day 1 to 28, from day 1 to 60, or a divided regimen from day 1 to 28 plus day 60 to 88. Control animals received 0.9% saline injections from day 1 to 28. All animals received full supportive care and were followed for 180 days. A survival relationship was observed with the AEOL 10150 treatment and time after lethal WTLI. Analysis of survival curves suggested that treatment efficacy could be increased by extending the treatment schedule to 90 days or longer after WTLI. No survival improvement was noted in the AEOL 10150 cohorts treated from day 1 to 28 or using the divided schedule of day 1–28 plus day 60–88. These results suggest that AEOL 10150 may be an effective countermeasure against lung injury. Genistein (4', 5, 7-trihydroxyisoflavone) is a soy-derived isoflavone with selective estrogen receptor activation, protein tyrosine kinase inhibition, antioxidant, and free radical scavenging activities., Genistein can act as both a radioprotector and a radiomitigator. BIO 300 is an aqueous nanosuspension consisting of synthetic genistein that is manufactured using a proprietary nanomilling process that significantly reduces the genistein particle size. This formulation has several key advantages including improved bioavailability and ease of administration. Initial preclinical study carried out at the Armed Forces Radiobiology Research Institute using murine models established genistein's radioprotective efficacy. A single dose of BIO 300 significantly improved 30-day survival in mice exposed to 9.25 Gy 60Co γ-radiation. BIO 300 underwent further development as a radiomitigator for ARS and DEARE at Humanetics Pharmaceuticals. Genistein, used as a mitigator, was reported in clinical trials to reduce adverse effects of chemotherapy and radiotherapy., In a murine model of ARS, genistein protected bone marrow progenitor cells from radiation-induced injury, leading to prevention of hematopoietic stem cell pool exhaustion, and thereby augmenting subsequent recovery of blood neutrophil and platelet levels.,, Genistein also increased murine survival after thoracic irradiation. Several mechanisms have been proposed for the radioprotective efficacy of genistein, including activation of the DNA repair enzyme, quiescence of the cell cycle of Lin - cells in the G0/G1 phase in vivo, and the suppression of inflammation. Currently, BIO 300 is being investigated for pharmacokinetics and efficacy in NHPs as a radioprotector against total-body 60Co γ-irradiation when administered sc or per os (po). A truncated version of flagellin, Entolimod, retains its radioprotective efficacy and stability without its immunogenic properties. Entolimod acts as an agonist of toll-like receptor 5 and triggers nuclear factor-kB signaling that drives expression of numerous genes, including inhibitors of apoptosis, scavengers of reactive oxygen species, and a cascade of protective or regenerative cytokines. Granulocyte colony-stimulating factor (G-CSF) and interleukin-6 (IL-6) have been identified as biomarkers to assess Entolimod efficacy. Both cytokines were found to play significant roles in its mechanisms pertinent to enhanced survival in irradiated mice. The administration of antibody to either G-CSF or IL-6 effectively abrogates the radioprotective efficacy of Entolimod in irradiated mice. Entolimod has been shown to be effective against both H-ARS and GI-ARS in mice as well as NHPs, acting as both radioprotector and radiomitigator., Entolimod treatment reduces apoptosis and accelerates crypt regeneration in the GI tract. These attributes make Entolimod a potentially useful countermeasure for both civilian and military personnel alike. The FDA has granted IND, fast track, and orphan drug status to Entolimod as a radiation countermeasure. Clinical studies with healthy human volunteers demonstrated that Entolimod is systemically well tolerated and had biomarker results corresponding to the previous biomarker data from animal models of ARS.,, A pre-EUA dossier for Entolimod has been submitted to the FDA for review. Its sponsor, Cleveland BioLab, Inc., continues to discuss requirements for submission of a BLA. Ex-RAD (a chlorobenzylsulfone derivative) is a small-molecule kinase inhibitor, and it provided significant protection against 60Co γ-irradiation when administered sc (500 mg/kg) to C3H/HeN mice 24 h and 15 min before irradiation, with a dose reduction factor of 1.16. Ex-RAD also demonstrated a significant survival benefit after prophylactic po administration. This drug accelerated the recovery of peripheral blood elements in irradiated mice when administered either sc or po., Ex-RAD manifests its protective effects through the upregulation of phosphatidylinositol 3-kinase/Akt (serine/threonine kinase, protein kinase B) pathways in cells exposed to radiation. Effective po administration makes Ex-RAD a potentially interesting and useful countermeasure that might be used to treat first responders as well as at-risk civilian populations in the event of a nuclear accident. NHP studies have been initiated in our laboratory to investigate its radioprotective and radiomitigative potential when administered either sc or po. Leukine has the FDA approval for five indications, three of which relate to the acceleration of neutrophil recovery in myelosuppressed patients. Leukine has been used to treat 14 radiation-exposed victims in three different accidents (dose range of 2.4–8.1 Gy), of whom nine survived., Although Leukine would certainly be utilized in cases of major radiological exposure contingencies and is well recognized to be effective in treating ARS, it has not been fully approved by the FDA for the specific treatment of ARS. The radioprotective efficacy of Leukine has been evaluated in mice, canines, and NHPs.,,, Unlike G-CSF, GM-CSF is species-specific. Recombinant human and canine GM-CSF have been used in NHP and canine studies, respectively. GM-CSF enhances the recovery of white blood cells in different strains of mice, canines, and NHPs when administered either alone or in combination with other cytokines., Results consistently support recovery from severe neutropenia as an advantage of using GM-CSF in H-ARS. In murine and canine studies where the effectiveness of G-CSF and GM-CSF has been compared, G-CSF was found to be more effective in protecting irradiated animals., Recently, GM-CSF has been evaluated as a radiomitigator in NHPs and found to significantly improve survival when administered 48 h postirradiation (7 μg/kg/day, sc, number of doses depended on neutrophil counts) with minimal supportive care (i.e. Baytril antibiotic and no blood products) against two different doses of radiation (6.55 Gy and 7.18 Gy). It is important to note that G-CSF was not effective when evaluated in the absence of full supportive care (blood products). Sanofi is preparing a supplemental BLA submission to the FDA. HemaMax has been shown to enhance mouse survival when administered as a single dose, either 24 h before or 1 h or 24 h after total-body irradiation (TBI). Neumedicines is developing HemaMax as a radiomitigator for the treatment of H-ARS and is planning a BLA submission to the FDA in the near future. Allometrically equivalent doses of mouse and human IL-12 have comparable pharmacokinetics. IL-12 administration significantly increased NHP survival in the study without supportive care when administered through parenteral route 24 h postirradiation. Myeloid progenitor cell (MPC) has been investigated for its use as a bridging therapy for radiation injuries and to mitigate the effects of lethal doses of 60Co γ-radiation and X-rays in different strains of mice. Pooled allogeneic MPC from AKR, C57Bl/6, and FVB mice was administered intravenously into haplotype-mismatched recipient BALB/c or CD2F1 mice at different time points after irradiation to evaluate the effect of MPC administration on survival in mice. The cryopreserved allogeneic MPC significantly protected both strains of mice irradiated with lethal doses of 60Co γ-radiation. The survival benefit in mice was MPC-dose-dependent and significant even when administered 7 days postirradiation. In addition, MPC administration decreased deaths from ARS at radiation doses as high as 15 Gy in CD2F1 mice. The histopathology of GI tissue from irradiated and MPC-injected mice demonstrated improved gut architecture compared to untreated controls. The effect of MPC administration on bacterial translocation from the GI to the heart, spleen, and liver in irradiated mice was also investigated by bacterial colony cultures and measuring endotoxin levels in serum samples. MPC decreased bacterial infection and inhibited endotoxin levels in serum. The results of these studies support administration of MPC as a bridging therapy, not only for the hematopoietic system but also for GI-ARS. Cellerant Therapeutics, Inc. (San Carlos, CA, USA) is developing a cell-based therapy containing human myeloid progenitors, CLT-008. This agent has received US FDA IND status (Cellerant Therapeutics – personal communication). Derived from adult hematopoietic stem cells, CTL-008 can produce functional granulocytes, red blood cells, and platelets in vivo. It is currently under clinical studies. OrbeShield is a potent, topically active corticosteroid under development as an orally administered radiation countermeasure for GI-ARS. Beclomethasone 17,21-dipropionate demonstrated significant survival benefit in a canine model of GI-ARS. Canines received TBI, followed by autologous bone marrow administration and supportive care. There were three groups in this study: one control group and two OrbeShield-treated groups; both groups underwent different treatment schedules. Both OrbeShield-treated groups had higher survivors compared to the control group, indicating that OrbeShield can rescue inflamed tissues of the GI mucosa after irradiation, leading to improve survival benefits when drug treatment is initiated as late as 24 h postirradiation. OrbeShield has received IND, orphan drug, and fast track statuses from US FDA. No reports exist regarding its toxicity and pharmacokinetics in humans. OrbeShield is available in the US as the active pharmaceutical ingredient in a nasal spray and inhaler used for the treatment of asthma and allergic rhinitis. This property may be helpful for the development of this agent as a countermeasure. Although we have not come across any published result in NHPs, such studies may be being conducted currently. There are several promising radiation countermeasures that do not have FDA IND status yet but are moving forward with NHP studies. Some of these agents are discussed below. Gamma-tocotrienol (GT3) has comparable radioprotective efficacy and appears to be better than other tocols as a radioprotectant based on its evaluation in the murine model of ARS., GT3 is an inhibitor of 3-hydroxy-3-methylglutaryl-coenzyme A reductase  and is being developed as a radioprotector for military and civilian use. Its radioprotective studies in murine model have been reviewed recently. We have conducted a proteomics study of serum and jejuna samples from irradiated mice-administered GT3. 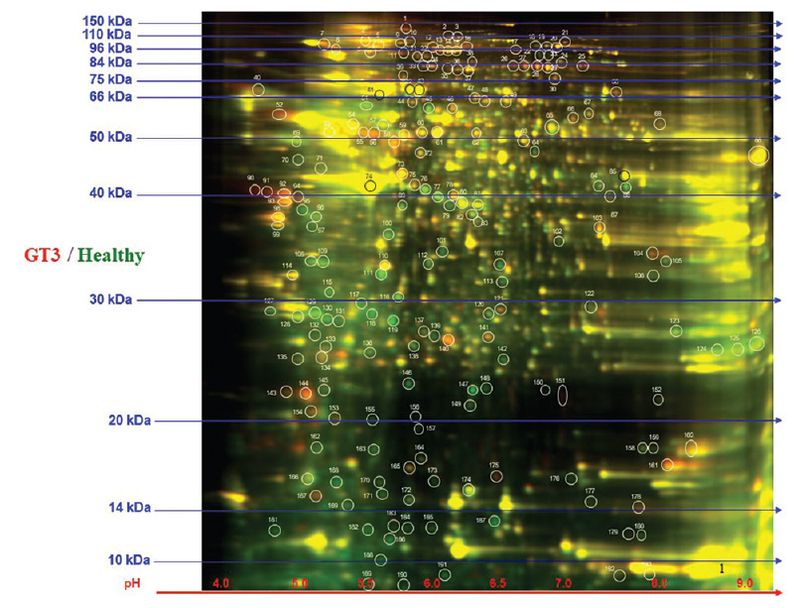 These samples were analyzed by high-performance two-dimensional difference in gel electrophoresis, matrix-assisted laser desorption/ionization time of flight tandem mass spectrometry, and database for annotation, visualization, and integrated discovery (DAVID). Lysates were labeled with two different Cy dyes (Cy3 or Cy5); as an internal control, lysates from vehicle- and GT3-treated groups were pooled and labeled with Cy2 [Figure 1]. When jejuna lysate from healthy mice were compared to irradiated mice exposed to 11 Gy and treated with either vehicle or GT3, 142 and 21 proteins, respectively, were differentially expressed (including isomers of the same proteins). In brief, GT3 treatment reduced the number of proteins altered by irradiation, making them more closely resemble the response of healthy animals. Similar observations have been made in ongoing transcriptomic study of NHP brain tissue (unpublished observation) and recently published microRNA (miRNA) results with NHP serum samples. 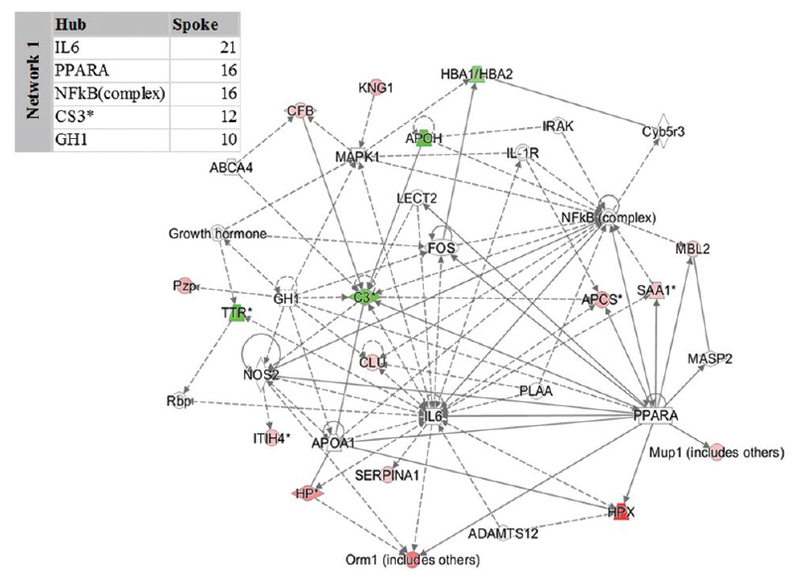 The jejunal lysate from irradiated and vehicle-treated mice compared to that of irradiated and GT3-treated mice demonstrated 65 differentially expressed proteins. When serum proteins were compared between healthy mice and mice irradiated with 11 Gy and treated with either vehicle or GT3, 54 proteins were differentially expressed in vehicle-treated animals compared with 129 proteins differentially expressed in GT3-treated animals. The serum proteins from irradiated, vehicle-treated mice compared to that of irradiated GT3-treated mice demonstrated 91 proteins differentially expressed. 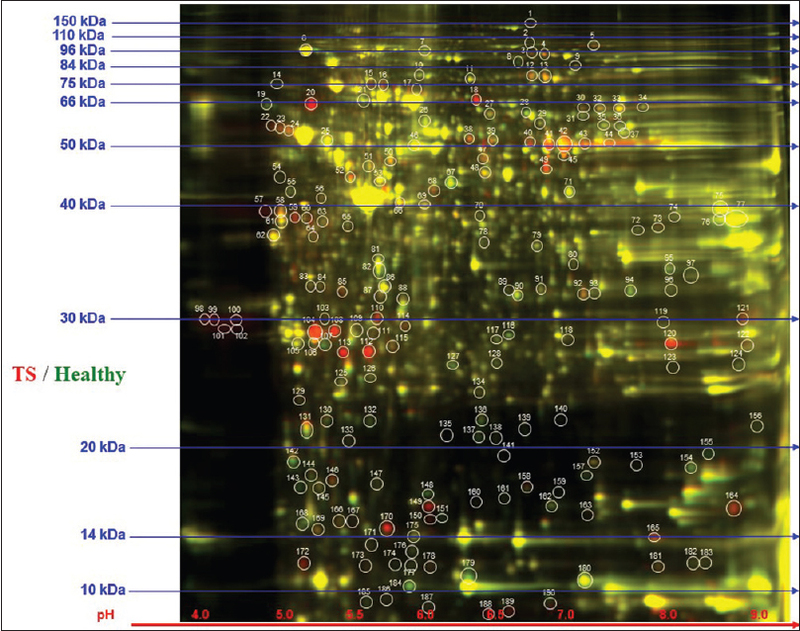 The proteins identified as being differentially expressed were uploaded to the DAVID software. 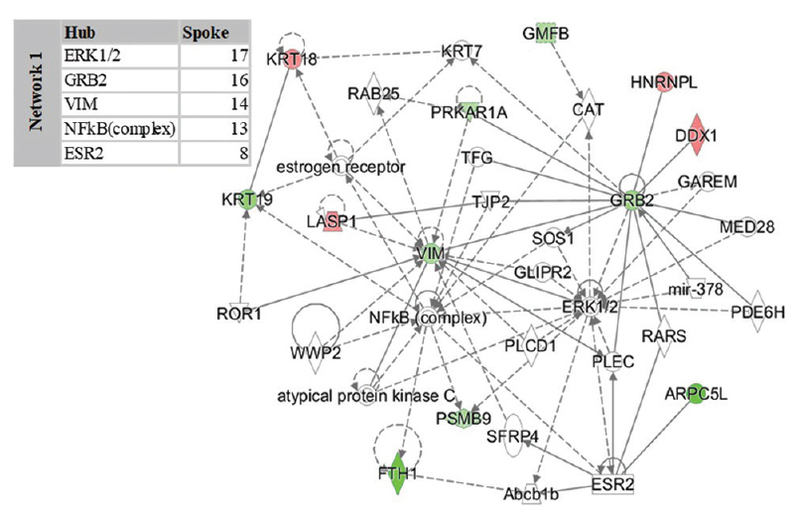 Ingenuity pathway analysis (IPA, Ingenuity Systems, Redwood City, CA, USA) was then used to integrate the proteins into pathways and networks based on biological and/or functional relevance to the other proteins as well as the significance value of uploaded proteins. The IPA of the jejuna proteins yielded five top canonical pathways: calcium signaling, actin cytoskeleton signaling, epithelial adherens junction signaling, RhoGDI signaling, and a granulocyte adhesion and diapedesis. 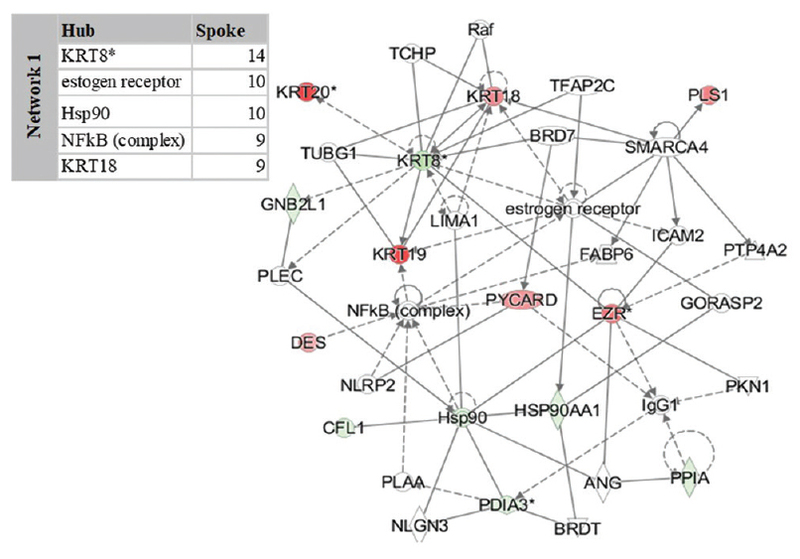 The top network-associated functions are cell signaling, posttranslational modification, and protein synthesis [Figure 2]. The IPA of the serum proteins yielded 5five top canonical pathways: acute phase response signaling, liver X receptor/retinoid X receptor (RXR) activation, farnesoid X receptor/RXR activation, complement system, and coagulation system. 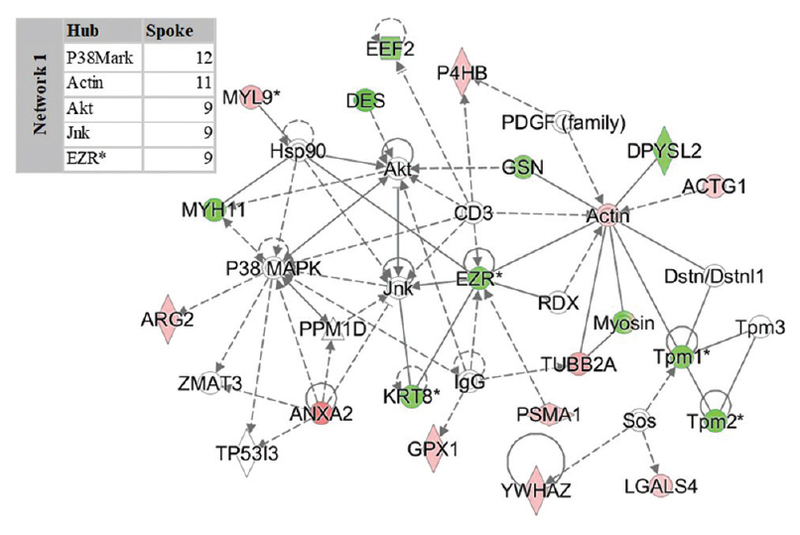 The top network-associated functions are free radical scavenging, metabolic disease, and humoral immune response [Figure 3]. In addition, we also performed similar proteomic analysis on another tocol radiation countermeasure that is under evaluation, tocopherol succinate. The results with jejunum of mice exposed to 9.2 Gy of this analysis are presented in [Figure 4], [Figure 5], [Figure 6]. We have conducted similar study in mice exposed to 11 Gy (data not presented) and these results support data with 9.2 Gy. GT3 has been investigated for its radioprotective efficacy against 60Co γ-irradiation using an NHP model with encouraging results. GT3 helped in the recovery of radiation-induced thrombocytopenia and neutropenia in irradiated NHPs compared to the vehicle controls; these results were especially significant after lethal exposures to 5.8 or 6.5 Gy 60Co γ-TBI. The stimulatory effect of GT3 on platelets and neutrophils was positively and directly correlated with radiation dose; the 75 mg/kg dose was more effective compared to a dose of 37.5 mg/kg. GT3 was also effective against 6.5 Gy whole-body γ-irradiation in improving platelet and neutrophil counts. Furthermore, a single dose of GT3, without any supportive care, was comparable to multiple doses of Neupogen and two doses of Neulasta with full supportive care (including blood products) in terms of improving hematopoietic recovery in the NHP. Using the NHP model, it was demonstrated that three miRNAs correlated with the radioprotective efficacy of GT3. These miRNAs in GT3-treated and irradiated NHPs resembled the unirradiated animals: miR-30a, miR-126, and miR-375. Global metabolomic and lipidomic changes have been analyzed in serum samples of unirradiated NHP-administered GT3. Our study demonstrates that alterations in metabolites manifest only 24 h after GT3 administration. Furthermore, metabolic changes are associated with a transient increase in the bioavailability of antioxidants, including lactic acid, cholic acid, and anti-inflammatory metabolites, 3 deoxyvitamin D3 and docosahexaenoic acid. In addition, our pilot study using irradiated NHPs demonstrated several metabolites that are altered after radiation exposure, including compounds involved in fatty acid-β oxidation, purine catabolism, and amino acid metabolism. Primary metabolites validated included amino acids, carnitine/acylcarnitines, creatine, and xanthine. GT3 administration reduced high fluctuations in serum metabolite levels, demonstrating a beneficial effect on animals exposed to radiation. This initial assessment also highlights the utility of metabolomics and lipidomics to determine the underlying physiological mechanisms involved in the radioprotective efficacy of GT3. As a adrenoreceptor agonist, indralin exerts its radioprotective efficacy through activation of α1(B)-adrenoreceptors, members of G-protein-coupled receptors. Its radioprotective efficacy has been evaluated in seven animal models (mice, rats, hamsters, guinea pigs, rabbits, canines, and NHPs), and it demonstrated consistent efficacy., Its efficacy was investigated in NHPs using whole-body 60Co γ-radiation. Animals received a dose of 6.8 Gy radiation with 100% lethality in control over 30 days. Indralin (40–120 mg/kg) was administered intramuscularly 5 min before irradiation. At a dose of 120 mg/kg, it protected five out of six NHPs compared with the control group in which all 10 animals died. Indralin decreased radiation-induced injuries in NHPs, mitigating the effects of ARS. The therapeutic index for indralin, the ratio of the maximum tolerated dose to the average effective dose, was 10. These results demonstrate that indralin has promising radioprotective efficacy and has a high therapeutic index. PLX-R18 cells are three-dimensional-expanded placenta-derived cells with the ability to protect and regenerate bone marrow. These cells secrete several cytokines including G-CSF, IL-6, monocyte chemoattractant protein-1, and growth-regulated oncogene (also known as keratinocyte chemoattractant), which participate in reconstitution of hematopoietic system  and provided survival benefit in irradiated C3H/HeN mice. PLX-R18 helps in recovery of white blood cells, red blood cells, and platelets in irradiated animals. Recently, PLX-R18 was investigated in irradiated NHPs as an intramuscular injection. Although the sample size in the NHP study was small (six or seven NHPs/group), all PLX-R18-treated NHP groups (4, 10, and 20 million cells/kg) demonstrated improved survival as compared to untreated group where mortality was 50%. This agent has been granted orphan drug status by the US FDA. In unirradiated animals, these cells do not increase CBC in recipient animals, suggesting that this agent can be given to probable radiation exposed victims without assessing the radiation dose. Alpha-methyl Hydrocinnamate (ST7) extends signal transducer and activator of transcription 5 phosphorylation, reduces growth-factor dependence of multi-lineage cells, and accelerates erythropoiesis. ST7 and its isomer (ST7-S) were studied for their effects on myeloid progenitors and hematopoietic stem cells following irradiation in NHP and mice models. Addition of ST7 or ST7-S increased granulocyte macrophage colony-forming unit production, reduced neutrophil apoptosis, and enhanced hematopoietic stem cell survival postradiation. ST7 and ST7-S administered in normal baboons increased neutrophil and platelet counts by 50%–400%. Collectively, the studies indicate that ST7 and ST7-S enhance myeloid recovery postradiation and merit further evaluation to accelerate hematologic recovery and survival benefit after irradiation. Irradiation causes the release of acid sphingomyelinase within minutes to the outer endothelial plasma membrane where it finds its substrate, sphingomyelin, and generates the pro-apoptotic second messenger, ceramide. Ceramide assembles a signaling platform on the endothelial surface that mediates apoptosis, and coupling of microvessel injury to direct intestinal stem cell (ISC) damage coordinately determines ISC survival from irradiation. The antagonism of ceramide on the irradiated endothelial surface prevents the formation of ceramide-rich platforms required for endothelial death, thereby protecting mice against GI-ARS lethality. Anticeramide monoclonal antibody binds to ceramide, preventing the formation of signaling platforms, protecting the cell and tissue from radiation-induced apoptosis. This protective process appears to facilitate the recovery of crypt stem cell clonogens in GI tissue of radiation-induced GI-ARS. Anticeramide antibody has been reported to protect C57BL/6 mice when administered prophylactically via intravenous infusion 15 min before radiation exposure (15 Gy, 2.12 Gy/min) with a 137Cs source. This agent has been extensively studied in our laboratory over several years and demonstrated remarkable efficacy against GI-ARS (unpublished observation). Anticeramide antibody represents a new class of radiation countermeasures that may be effective against radiation-induced GI-ARS. This agent is expected to be evaluated for its pharmacokinetics and efficacy NHPs soon. From the US and global perspectives, biomedical research concerning medical countermeasure development for life-threatening conditions is quite robust in the US as well as in some other countries, mainly due to greater government funding following the 9/11 incidence and subsequently significant rise in terrorist-associated threats. Unfortunately, only a limited number of radiation countermeasures have been fully approved by the US FDA. Nine radiation countermeasures have received FDA IND status, and three agents mitigating radiation injury, Neupogen, Neulasta, and Leukine, have already been procured by the US government for the vendor-managed inventory. Although significant progress has been made in radiation countermeasure development over the last several years, additional effort is required to push new promising agents through the regulatory pipeline for early approval. This approval pipeline for new promising agents appears to be unreasonably slow and cumbersome. The dearth of FDA-approved radiation countermeasures has prompted intensified search for a new generation of radiation countermeasures. Several promising radiation countermeasures, particularly for ARS, are currently moving forward with continued support and effort by both governmental agencies and publicly and privately owned pharmaceutical companies. There are a limited number of countermeasures that are moving well following the FDA Animal Rule and may be approved soon. Such effort will close the gap of this critically important, unmet need of radiation countermeasures. We completely recognize that our listing of drugs being investigated in NHP model may not be exhaustive and up to date due to the lack of accessibility to recently generated data with potential radiation countermeasures. Such inaccessibility is due to the vested financial interests of the pharmaceutical companies in protecting potentially marketable agents. Issues of confidentiality and the “intellectual property rights” of pharmaceutical companies and government agencies, particularly the US FDA, also limit accessibility. We have mentioned few agents for which NHP data is not available, but we expect that such agents are under investigation in NHPs. Although significant progress has been made, additional effort is still needed. The FDA has not yet approved any agent for use as a radioprotector for H-ARS following the Animal Rule. Both FDA-approved agents for H-ARS are radiomitigators. Further, no drug has been approved for GI-ARS, either as a radioprotector or as a radiomitigator. There are several reasons for such failure. Some important issues are the shortage of multiple large animal models that represent the pathophysiology of humans for studying radiation injury and the lack of corporate interest for the development of such agents. The development of such agents will have a small market, limiting the revenue generation to offset the investment on such agent's FDA approval. The FDA Animal Rule emphasizes a good understanding of the pathophysiology of radiation injury, a well-understood mechanism of action of agents under development, and the identification of biomarkers for drug dose conversion (animal to human) and to also serve as a predictive marker for the efficacy in humans. Accomplishing these tasks for FDA approval is not easy, and as a result, several radiation countermeasures at advanced stages of development remain stagnant for significant periods of time. Due to such hurdles, the corporate entity loses interest for the development of such agents. These issues emphasize the need for a combined effort between academia, corporate partners, and government agencies. The FDA has come out with various options to attract corporate partners, but these incentives may not be enough to keep corporate partners interested. Repurposing the FDA-approved drugs for another indication is reasonable approach to save money and time and to avoid excessive risks associated with new drug development and approval. Such an approach requires attention from scientists as well as funding agencies. The Radiation Countermeasure Program of National Institute of Allergy and Infectious Diseases as well as Biomedical Advanced Research and Development Authority has supported repurposing efforts with several agents expected to be approved as radiation countermeasures. Although the traditional pathway of radiation countermeasure development must be supported, repurposing should also be explored. There are many agents that have dual use and are being investigated as radiation countermeasures for GI-ARS as well as for H-ARS. Further, combinations of different agents are being tested where one agent is already approved by FDA for another indication. There are studies in recent past using combinations of two drugs for additive efficacy. The opinions or assertions contained herein are the private views of the authors and are not necessarily those of the Armed Forces Radiobiology Research Institute, the Uniformed Services University of the Health Sciences, or the Department of Defense. Mention of specific therapeutic agents does not constitute endorsement by the US Department of Defense, and trade names are used only for clarification. We gratefully acknowledge the research support from the National Institute of Allergy and Infectious Diseases (AAI-12044-0000-05000, Work Plan G) and Congressionally Directed Medical Research Programs (W81XWH-15-C-0117, JW140032) of the US Department of Defense to VKS. We also appreciate the help of Mr. Joshua Starr for IPA. We apologize to those having contributed substantially to the topics discussed herein that we were unable to cite because of space constraints. Singh VK, Seed TM. A review of radiation countermeasures focusing on injury-specific medicinals and regulatory approval status: Part I. Radiation sub-syndromes, animal models and FDA-approved countermeasures. Int J Radiat Biol 2017;93:851-69. U.S. Food and Drug Administration. Guidance for Industry: Product Development under the Animal Rule; 2015. Available from: http://www.fda.gov/downloads/Drugs/GuidanceComplianceRegulatoryInformation/Guidances/UCM399217.pdf. [Last accessed on 2016 Jul 05]. Aebersold P. FDA experience with medical countermeasures under the animal rule. Adv Prev Med 2012;2012:507571. U.S. Food and Drug Administration. Developing Products for Rare Diseases & Conditions; 2017. Available from: https://www.fda.gov/ForIndustry/DevelopingProductsforRareDiseasesConditions/ucm2005525.htm. [Last accessed on 2017 Dec 24]. U.S. Food and Drug Administration. Fast Track; 2017. Available from: https://www.fda.gov/ForPatients/Approvals/Fast/ucm405399.htm. [Last accessed on 2017 Dec 22]. U.S. Food and Drug Administration. Emergency Use Authorization; 2017. Available from: https://www.fda.gov/EmergencyPreparedness/Counterterrorism/MedicalCountermeasures/MCMLegal RegulatoryandPolicyFramework/ucm182568.htm. [Last accessed on 2017 Dec 24]. Austin BA, Gadhia AD. New therapeutic uses for existing drugs. Adv Exp Med Biol 2017;1031:233-47. National Institute of Allergic and Infectious Diseases. Pegfilgrastim Approved for Treating Acute Radiation Syndrome; 2015. Available from: https://www.niaid.nih.gov/topics/radnuc/Pages/pegfilgrastim.aspx. [Last accessed on 2016 Aug 18]. Farese AM, MacVittie TJ. Filgrastim for the treatment of hematopoietic acute radiation syndrome. Drugs Today (Barc) 2015;51:537-48. U.S. Food and Drug Administration. Investigational New Drug (IND) Application; 2017. Available from: https://www.fda.gov/Drugs/DevelopmentApprovalProcess/HowDrugsareDevelopedandApproved/ApprovalApplications/InvestigationalNewDrugINDApplication/default.htm. [Last accessed on 2017 Dec 23]. U.S. Food and Drug Administration. New Drug Application (NDA); 2016. Available from: https://www.fda.gov/Drugs/DevelopmentApprovalProcess/HowDrugsareDevelopedandApproved/ApprovalApplications/NewDrugApplicationNDA/default.htm. [Last accessed on 2017 Dec 23]. Vallender EJ, Miller GM. Nonhuman primate models in the genomic era: A paradigm shift. ILAR J 2013;54:154-65. Singh VK, Olabisi AO. Nonhuman primates as models for the discovery and development of radiation countermeasures. Expert Opin Drug Discov 2017;12:695-709. Herodin F, Mestries JC, Janodet D, Martin S, Mathieu J, Gascon MP, et al. Recombinant glycosylated human interleukin-6 accelerates peripheral blood platelet count recovery in radiation-induced bone marrow depression in baboons. Blood 1992;80:688-95. Raabe BM, Lovaglio J, Grover GS, Brown SA, Boucher JF, Yuan Y, et al. Pharmacokinetics of cefovecin in cynomolgus macaques (Macaca fascicularis), olive baboons (Papio anubis), and rhesus macaques (Macaca mulatta). J Am Assoc Lab Anim Sci 2011;50:389-95. Valente M, Denis J, Grenier N, Arvers P, Foucher B, Desangles F, et al. Revisiting biomarkers of total-body and partial-body exposure in a baboon model of irradiation. PLoS One 2015;10:e0132194. Port M, Herodin F, Valente M, Drouet M, Lamkowski A, Majewski M, et al. First generation gene expression signature for early prediction of late occurring hematological acute radiation syndrome in baboons. Radiat Res 2016;186:39-54. Port M, Herodin F, Valente M, Drouet M, Ullmann R, Doucha-Senf S, et al. MicroRNA expression for early prediction of late occurring hematologic acute radiation syndrome in baboons. PLoS One 2016;11:e0165307. Port M, Hérodin F, Valente M, Drouet M, Lamkowski A, Majewski M, et al. Gene expression signature for early prediction of late occurring pancytopenia in irradiated baboons. Ann Hematol 2017;96:859-70. Port M, Hérodin F, Valente M, Drouet M, Ullmann R, Majewski M, et al. Pre-exposure gene expression in baboons with and without pancytopenia after radiation exposure. Int J Mol Sci 2017;18. pii: E541. Zhang Y, Zhang X, Rabbani ZN, Jackson IL, Vujaskovic Z. Oxidative stress mediates radiation lung injury by inducing apoptosis. Int J Radiat Oncol Biol Phys 2012;83:740-8. Orrell RW. AEOL-10150 (Aeolus). Curr Opin Investig Drugs 2006;7:70-80. Murigi FN, Mohindra P, Hung C, Salimi S, Goetz W, Pavlovic R, et al. Dose optimization study of AEOL 10150 as a mitigator of radiation-induced lung injury in CBA/J mice. Radiat Res 2015;184:422-32. Aeolus Pharmaceuticals. Aeolus Pharmaceuticals Announces AEOL 10150 Reduces Lung Damage after Neupogen Treatment following Radiation Exposure; 2012. Available from: http://www.aolsrx.com/news/press-releases/detail/924/aeolus-pharmaceuticals-announces-aeol-10150-reduces-lung. [Last accessed on 2014 Jul 03]. Garofalo MC, Ward AA, Farese AM, Bennett A, Taylor-Howell C, Cui W, et al. Apilot study in rhesus macaques to assess the treatment efficacy of a small molecular weight catalytic metalloporphyrin antioxidant (AEOL 10150) in mitigating radiation-induced lung damage. Health Phys 2014;106:73-83. MacVittie TJ, Gibbs A, Farese AM, Barrow K, Bennett A, Taylor-Howell C, et al. AEOL 10150 mitigates radiation-induced lung injury in the nonhuman primate: Morbidity and mortality are administration schedule-dependent. Radiat Res 2017;187:298-318. Kruk I, Aboul-Enein HY, Michalska T, Lichszteld K, Kładna A. Scavenging of reactive oxygen species by the plant phenols genistein and oleuropein. Luminescence 2005;20:81-9. Akiyama T, Ishida J, Nakagawa S, Ogawara H, Watanabe S, Itoh N, et al. Genistein, a specific inhibitor of tyrosine-specific protein kinases. J Biol Chem 1987;262:5592-5. Landauer MR, Srinivasan V, Seed TM. Genistein treatment protects mice from ionizing radiation injury. J Appl Toxicol 2003;23:379-85. Ha CT, Li XH, Fu D, Xiao M, Landauer MR. Genistein nanoparticles protect mouse hematopoietic system and prevent proinflammatory factors after gamma irradiation. Radiat Res 2013;180:316-25. Humanetics Pharmaceuticals. BIO 300: Development Programs; 2016. Available from: http://www.humanetics.a03.neon.ittrium.com/development-programs. [Last accessed on 2017 Jul 05]. Tacyildiz N, Ozyoruk D, Yavuz G, Unal E, Dincaslan H, Dogu F, et al. Soy isoflavones ameliorate the adverse effects of chemotherapy in children. Nutr Cancer 2010;62:1001-5. Ahmad IU, Forman JD, Sarkar FH, Hillman GG, Heath E, Vaishampayan U, et al. Soy isoflavones in conjunction with radiation therapy in patients with prostate cancer. Nutr Cancer 2010;62:996-1000. Davis TA, Clarke TK, Mog SR, Landauer MR. Subcutaneous administration of genistein prior to lethal irradiation supports multilineage, hematopoietic progenitor cell recovery and survival. Int J Radiat Biol 2007;83:141-51. Davis TA, Mungunsukh O, Zins S, Day RM, Landauer MR. Genistein induces radioprotection by hematopoietic stem cell quiescence. Int J Radiat Biol 2008;84:713-26. Para AE, Bezjak A, Yeung IW, Van Dyk J, Hill RP. Effects of genistein following fractionated lung irradiation in mice. Radiother Oncol 2009;92:500-10. Singh VK, Garcia M, Seed TM. A review of radiation countermeasures focusing on injury-specific medicinals and regulatory approval status: Part II. Countermeasures for limited indications, internalized radionuclides, emesis, late effects, and agents demonstrating efficacy in large animals with or without FDA IND status. Int J Radiat Biol 2017;93:870-84. Burdelya LG, Krivokrysenko VI, Tallant TC, Strom E, Gleiberman AS, Gupta D, et al. An agonist of toll-like receptor 5 has radioprotective activity in mouse and primate models. Science 2008;320:226-30. Krivokrysenko VI, Shakhov AN, Singh VK, Bone F, Kononov Y, Shyshynova I, et al. Identification of granulocyte colony-stimulating factor and interleukin-6 as candidate biomarkers of CBLB502 efficacy as a medical radiation countermeasure. J Pharmacol Exp Ther 2012;343:497-508. Cleveland BioLabs Inc. Entolimod (CBLB502) Biodefense; 2016. Available from: http://www.cbiolabs.com/. [Last accessed on 2016 Jun 10]. Krivokrysenko VI, Toshkov IA, Gleiberman AS, Krasnov P, Shyshynova I, Bespalov I, et al. The toll-like receptor 5 agonist entolimod mitigates lethal acute radiation syndrome in non-human primates. PLoS One 2015;10:e0135388. Ghosh SP, Perkins MW, Hieber K, Kulkarni S, Kao TC, Reddy EP, et al. Radiation protection by a new chemical entity, ex-rad: Efficacy and mechanisms. Radiat Res 2009;171:173-9. Suman S, Datta K, Doiron K, Ren C, Kumar R, Taft DR, et al. Radioprotective effects of ON 01210. Na upon oral administration. J Radiat Res 2012;53:368-76. Ghosh SP, Kulkarni S, Perkins MW, Hieber K, Pessu RL, Gambles K, et al. Amelioration of radiation-induced hematopoietic and gastrointestinal damage by ex-RAD (R) in mice. J Radiat Res 2012;53:526-36. Kang AD, Cosenza SC, Bonagura M, Manair M, Reddy MV, Reddy EP, et al. ON01210. Na (Ex-RAD®) mitigates radiation damage through activation of the AKT pathway. PLoS One 2013;8:e58355. Sanofi-Aventis U.S. LLC. Leukine; 2013. Available from: http://www.products.sanofi.us/Leukine/Leukine.html. [Last accessed on 2016 Oct 20]. International Atomic Energy Agency. The Radiological Accident in San Salvador; 1990. Available from: http://www-pub.iaea.org/books/IAEABooks/3718/The-Radiological-Accident-in-San-Salvador. [Last accessed on 2014 Feb 20]. International Atomic Energy Agency. The Radiological Accident in Goiânia; 1988. Available from: http://www-pub.iaea.org/MTCD/Publications/PDF/Pub815_web.pdf. [Last accessed on 2016 Oct 02]. Atkinson K, Matias C, Guiffre A, Seymour R, Cooley M, Biggs J, et al. In vivo administration of granulocyte colony-stimulating factor (G-CSF), granulocyte-macrophage CSF, interleukin-1 (IL-1), and IL-4, alone and in combination, after allogeneic murine hematopoietic stem cell transplantation. Blood 1991;77:1376-82. Monroy RL, Skelly RR, Taylor P, Dubois A, Donahue RE, MacVittie TJ, et al. Recovery from severe hematopoietic suppression using recombinant human granulocyte-macrophage colony-stimulating factor. Exp Hematol 1988;16:344-8. MacVittie TJ, Monroy RL, Farese AM, Patchen ML, Seiler FR, Williams D, et al. Cytokine therapy in canine and primate models of radiation-induced marrow aplasia. Behring Inst Mitt 1991;90:1-13. Clayton NP, Charpentier EJ, LaCasse ER, Khan-Malek RC, Keutzer, JM. Sargramostim significantly improved the mortality rate at Day 60 in a non-human primate model of hematopoietic acute radiation syndrome with minimal supportive care when administered 48 h after total body irradiation. 42nd Conference of the European Radiation Research Society. Amsterdam, Netherlands; 2016. p. 190. Singh VK, Newman VL, Seed TM. Colony-stimulating factors for the treatment of the hematopoietic component of the acute radiation syndrome (H-ARS): A review. Cytokine 2015;71:22-37. Waddick KG, Song CW, Souza L, Uckun FM. Comparative analysis of the in vivo radioprotective effects of recombinant granulocyte colony-stimulating factor (G-CSF), recombinant granulocyte-macrophage CSF, and their combination. Blood 1991;77:2364-71. Nash RA, Schuening FG, Seidel K, Appelbaum FR, Boone T, Deeg HJ, et al. Effect of recombinant canine granulocyte-macrophage colony-stimulating factor on hematopoietic recovery after otherwise lethal total body irradiation. Blood 1994;83:1963-70. Gluzman-Poltorak Z, Vainstein V, Basile LA. Recombinant interleukin-12, but not granulocyte-colony stimulating factor, improves survival in lethally irradiated nonhuman primates in the absence of supportive care: Evidence for the development of a frontline radiation medical countermeasure. Am J Hematol 2014;89:868-73. Neumedicines. HemaMax™ (rHuIL-12) for Acute Radiation Syndrome; 2014. Available from: http://www.neumedicines.com/. [Last accessed on 2014 Oct 27]. Gluzman-Poltorak Z, Mendonca SR, Vainstein V, Kha H, Basile LA. Randomized comparison of single dose of recombinant human IL-12 versus placebo for restoration of hematopoiesis and improved survival in rhesus monkeys exposed to lethal radiation. J Hematol Oncol 2014;7:31. Gluzman-Poltorak Z, Vainstein V, Basile LA. Association of hematological nadirs and survival in a nonhuman primate model of hematopoietic syndrome of acute radiation syndrome. Radiat Res 2015;184:226-30. Singh VK, Christensen J, Fatanmi OO, Gille D, Ducey EJ, Wise SY, et al. Myeloid progenitors: A radiation countermeasure that is effective when initiated days after irradiation. Radiat Res 2012;177:781-91. Cellerant Therapeutics. CLT-008 Myeloid Progenitor Cells; 2013. Available from: http://www.cellerant.com/. [Last accessed on 2016 Jul 04]. Whitnall MH, Wilhelmsen CL, McKinney L, Miner V, Seed TM, Jackson WE 3rd, et al. Radioprotective efficacy and acute toxicity of 5-androstenediol after subcutaneous or oral administration in mice. Immunopharmacol Immunotoxicol 2002;24:595-626. Stickney DR, Dowding C, Garsd A, Ahlem C, Whitnall M, McKeon M, et al. 5-androstenediol stimulates multilineage hematopoiesis in rhesus monkeys with radiation-induced myelosuppression. Int Immunopharmacol 2006;6:1706-13. Stickney DR, Dowding C, Authier S, Garsd A, Onizuka-Handa N, Reading C, et al. 5-androstenediol improves survival in clinically unsupported rhesus monkeys with radiation-induced myelosuppression. Int Immunopharmacol 2007;7:500-5. Whitnall MH, Villa V, Seed TM, Benjack J, Miner V, Lewbart ML, et al. Molecular specificity of 5-androstenediol as a systemic radioprotectant in mice. Immunopharmacol Immunotoxicol 2005;27:15-32. Whitnall MH, Elliott TB, Harding RA, Inal CE, Landauer MR, Wilhelmsen CL, et al. Androstenediol stimulates myelopoiesis and enhances resistance to infection in gamma-irradiated mice. Int J Immunopharmacol 2000;22:1-4. Loria RM, Conrad DH, Huff T, Carter H, Ben-Nathan D. Androstenetriol and androstenediol. Protection against lethal radiation and restoration of immunity after radiation injury. Ann N Y Acad Sci 2000;917:860-7. Singh VK, Shafran RL, Inal CE, Jackson WE 3rd, Whitnall MH. Effects of whole-body gamma irradiation and 5-androstenediol administration on serum G-CSF. Immunopharmacol Immunotoxicol 2005;27:521-34. Grace MB, Singh VK, Rhee JG, Jackson WE 3rd, Kao TC, Whitnall MH, et al. 5-AED enhances survival of irradiated mice in a G-CSF-dependent manner, stimulates innate immune cell function, reduces radiation-induced DNA damage and induces genes that modulate cell cycle progression and apoptosis. J Radiat Res 2012;53:840-53. Stickney DR, Groothuis JR, Ahlem C, Kennedy M, Miller BS, Onizuka-Handa N, et al. Preliminary clinical findings on NEUMUNE as a potential treatment for acute radiation syndrome. J Radiol Prot 2010;30:687-98. Davies J. U.S. Won't Buy Hollis-Eden Treatment for Radiation; 2007. Available from: http://www.legacy.sandiegouniontribune.com/news/business/biotech/20070317-9999-1b17hollis.html. [Last accessed on 2017 May 17]. Beaulieu D. US Government Rejects Hollis-Eden's Neumune Proposal; 2007. Available from: http://www. firstwordpharma.com/node/112458#axzz4hMkBsGLh. [Last accessed on 2017 May 17]. Soligenix Inc. OrbeShield™ for Gastrointestinal Acute Radiation Syndrome (GI ARS); 2016. Available from: http://www.soligenix.com/pipeline/vaccinesbiodefense/orbeshield-for-gastrointestinal-acute-radiation-syndrome-gi-ars/. [Last accessed on 2016 Jul 10]. Georges GE, Kuver RP, Jordan R, Aragon A, Yang Y, Lesnikova M. Post-exposure oral 17,21-beclomethasone dipropionate (BDP) improves survival in a canine gastrointestinal acute radiation syndrome (GI-ARS) model. 58th Annual Meeting of the Radiation Research Society. San Juan PR; 2012. Singh VK, Hauer-Jensen M. Γ-tocotrienol as a promising countermeasure for acute radiation syndrome: Current status. Int J Mol Sci 2016;17. pii: E663. Singh VK, Beattie LA, Seed TM. Vitamin E: Tocopherols and tocotrienols as potential radiation countermeasures. J Radiat Res 2013;54:973-88. Berbée M, Fu Q, Boerma M, Wang J, Kumar KS, Hauer-Jensen M, et al. Gamma-tocotrienol ameliorates intestinal radiation injury and reduces vascular oxidative stress after total-body irradiation by an HMG-CoA reductase-dependent mechanism. Radiat Res 2009;171:596-605. Singh VK, Kulkarni S, Fatanmi OO, Wise SY, Newman VL, Romaine PL, et al. Radioprotective efficacy of gamma-tocotrienol in nonhuman primates. Radiat Res 2016;185:285-98. Fendler W, Malachowska B, Meghani K, Konstantinopoulos PA, Guha C, Singh VK, et al. Evolutionarily conserved serum microRNAs predict radiation-induced fatality in nonhuman primates. Sci Transl Med 2017;9. pii: eaal2408. Cheema AK, Mehta KY, Fatanmi OO, Wise SY, Hinzman CP, Wolff J, et al. Ametabolomic and lipidomic serum signature from nonhuman primates administered with a promising radiation countermeasure, gamma-tocotrienol. Int J Mol Sci 2017;19. pii: E79. Pannkuk EL, Laiakis EC, Fornace AJ Jr., Fatamni OO, Singh VK. Ametabolomic serum signature from nonhuman primates treated with a radiation countermeasure, gamma-tocotrienol, and exposed to ionizing radiation. Health Phys 2017. [In press]. Vasin MV, Semenov LF, Suvorov NN, Antipov VV, Ushakov IB, Ilyin LA, et al. Protective effect and the therapeutic index of indralin in juvenile rhesus monkeys. J Radiat Res 2014;55:1048-55. Vasin MV, Antipov VV, Chernov GA, L'vova TS, Koroleva LV, Semenova LA, et al. Studies of the radiation-protective effects of indralin on the hematopoietic system of different species of animals. Radiats Biol Radioecol 1996;36:168-89. Pluristem Therapeutics Inc. Studies of PLX-R18 in ARS; 2017. Available from: http://www.pluristem.com/acute-radiation-syndrome-ars/. [Last accessed on 2017 Dec 28]. Faller DV, Castaneda SA, Zhou D, Vedamony M, Newburger PE, White GL, et al. An oral hemokineTM, α-methylhydrocinnamate, enhances myeloid and neutrophil recovery following irradiation in vivo. Blood Cells Mol Dis 2017;63:1-8. Rotolo J, Stancevic B, Zhang J, Hua G, Fuller J, Yin X, et al. Anti-ceramide antibody prevents the radiation gastrointestinal syndrome in mice. J Clin Invest 2012;122:1786-90. Farese AM, Williams DE, Seiler FR, MacVittie TJ. Combination protocols of cytokine therapy with interleukin-3 and granulocyte-macrophage colony-stimulating factor in a primate model of radiation-induced marrow aplasia. Blood 1993;82:3012-8. Farese AM, Myers LA, MacVittie TJ. Therapeutic efficacy of recombinant human leukemia inhibitory factor in a primate model of radiation-induced marrow aplasia. Blood 1994;84:3675-8. MacVittie TJ, Farese AM, Patchen ML, Myers LA. Therapeutic efficacy of recombinant interleukin-6 (IL-6) alone and combined with recombinant human IL-3 in a nonhuman primate model of high-dose, sublethal radiation-induced marrow aplasia. Blood 1994;84:2515-22. Farese AM, Hunt P, Grab LB, MacVittie TJ. Combined administration of recombinant human megakaryocyte growth and development factor and granulocyte colony-stimulating factor enhances multilineage hematopoietic reconstitution in nonhuman primates after radiation-induced marrow aplasia. J Clin Invest 1996;97:2145-51. MacVittie TJ, Farese AM, Herodin F, Grab LB, Baum CM, McKearn JP, et al. Combination therapy for radiation-induced bone marrow aplasia in nonhuman primates using synthokine SC-55494 and recombinant human granulocyte colony-stimulating factor. Blood 1996;87:4129-35. Dunbar CE, Takatoku M, Donahue RE. The impact of ex vivo cytokine stimulation on engraftment of primitive hematopoietic cells in a non-human primate model. Ann N Y Acad Sci 2001;938:236-44. Farese AM, MacVittie TJ, Roskos L, Stead RB. Hematopoietic recovery following autologous bone marrow transplantation in a nonhuman primate: Effect of variation in treatment schedule with PEG-rHuMGDF. Stem Cells 2003;21:79-89. Drouet M, Mourcin F, Grenier N, Leroux V, Denis J, Mayol JF, et al. Single administration of stem cell factor, FLT-3 ligand, megakaryocyte growth and development factor, and interleukin-3 in combination soon after irradiation prevents nonhuman primates from myelosuppression: Long-term follow-up of hematopoiesis. Blood 2004;103:878-85. Hérodin F, Thullier P, Garin D, Drouet M. Nonhuman primates are relevant models for research in hematology, immunology and virology. Eur Cytokine Netw 2005;16:104-16. Hérodin F, Roy L, Grenier N, Delaunay C, Baugé S, Vaurijoux A, et al. Antiapoptotic cytokines in combination with pegfilgrastim soon after irradiation mitigates myelosuppression in nonhuman primates exposed to high irradiation dose. Exp Hematol 2007;35:1172-81. Singh VK, Fatanmi OO, Wise SY, Newman VL, Romaine PL, Seed TM, et al. The potentiation of the radioprotective efficacy of two medical countermeasures, gamma-tocotrienol and amifostine, by a combination prophylactic modality. Radiat Prot Dosimetry 2016;172:302-10. 1 Are animal models a necessity for acute radiation syndrome drug discovery?